For the uninitiated, running can be a lonely, solitary existence. For those in the know, it is about passion for the sport, pride in our achievements and a supportive sense of community spirit. Running isn't just an exercise, it is a passion, and a lifestyle choice. Matt Teague, Craig Winter and Martin Day set up runr in 2016 to form a community so that on your breakfast coffee run or morning train commute, you could identify your fellow runners. In October 2015, Matt was inspired by conversations he had had with the running community and while on a train he felt there was a gap for a lifestyle brand where people could be identifiable as runners. He felt it would be a great way to pass the time, talk about runs, and what drives them to lace up and go. As passionate runners, the trio love interacting with people who share their passion for running, be that on social media talking about upcoming races, at the start of parkrun or even with friends in the pub post-training. But when you’re not online or about to race - how do you know who shares your passion for running? You might be sat next to someone on a train, or walk past someone in the street that might be as passionate about running and the benefits it can bring as you are. That’s where runr comes in. “We want people to see someone wearing runr and start a conversation by saying ‘Hi, I’m a runr too.” the team behind the brand said. 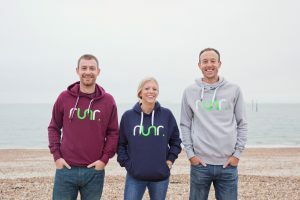 Runr sells a range of fitness and lifestyle products allowing people to show their passion for running and pride in their achievements.From hoodies made from 100% organic cotton to t-shirts made from 100% recycled material there are also mugs, hats and technical clothing. What is important to the brand is that running is not an exclusive club, but an inclusive one. They think that running is for anyone and everyone and has masses of benefits both physically and mentally, adding that it doesn’t matter how far you run or fast you are, but just that you have the courage to start. Ten per cent of all profits are donated to the charity Mind as a way to give back to a cause close to their hearts. Running is the perfect way to get out and clear your head, all you need is your trainers and a pavement to pound. In May they launched a virtual run called Miles For Mind . The purpose of which was to bring together a community of runners to help raise awareness of mental health by running and supporting each other. They said: “We had almost 1000 people in our first event and everyone who went out running would share it on social media and use the hashtags #MilesForMind and #MentalHealthMatters. “We had more than 50 blogs from the community who told their own personal story of what mental health and running means to them. It was humbling and inspiring to see how much awareness of mental health the community was able to generate, how many people were brave enough to talk about their personal experiences and how much money we were able to raise for Mind charity. Through running, runr feel that you can find a connection with a perfect stranger and it is hoped their products can bring people together. All runners are different, no journey is the same, but we all share the same goal, to be a runner. Run Wales subscribers can get 15% off at runr during December.